Well known as a Denver institution and a 9th Avenue landmark for more than 60 years, Rose Medical Center has earned a reputation as Denver's "Baby Hospital" while becoming a leader in comprehensive women's services, internal medicine, endoscopy, heart and vascular care, orthopedics and total joint replacement, bariatric surgery, sports medicine and aesthetic surgery. With origins in Jewish teachings, traditions and community, Rose's founders built the hospital to "serve the need of every creed." 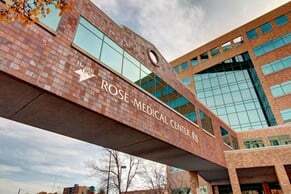 By offering a high level of expertise and service across all disciplines, Rose has truly become a destination hospital, attracting patients from throughout Colorado and around the world.